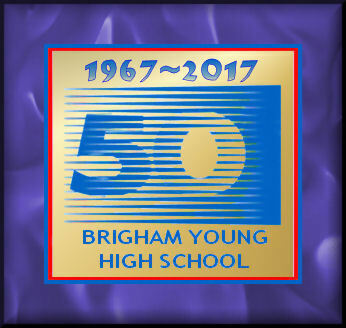 We held our 50th Anniversary Reunion on Friday, June 30, 2017 at the good old B.Y. High building in Room 309 at 6 p.m.
We served a dinner catered by Magleby’s. It was wonderful to see everyone! Joel Murphy coordinated all of our reunion efforts. Thanks Joel. Friday, those who were interested went to Brent and Charlene Ashworth's home at 1 pm to see Brent's collections of Church documents, Hoffman papers, Butch and Sundance history, etc. Please text Joel at 801-404-1199, De Ann at 801-361-2656, or Susan at 801-234-0081 to update your class info. 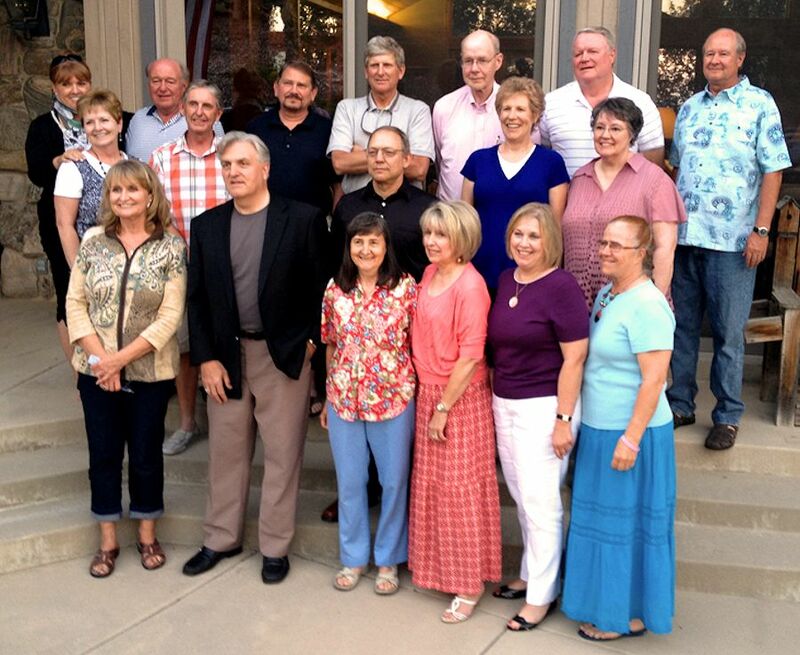 We are not aware of losing any additional classmates since our 45-year mini-reunion. We hope this is the case. Dal Olsen also made an appearance but had to leave early for another commitment. We had a great Bar B Que and get together at Dan Shaw’s Ranch in Elk Ridge, Friday evening, July 7, 2012. Thanks to De Ann Peterson Terry for the photo and identifications. 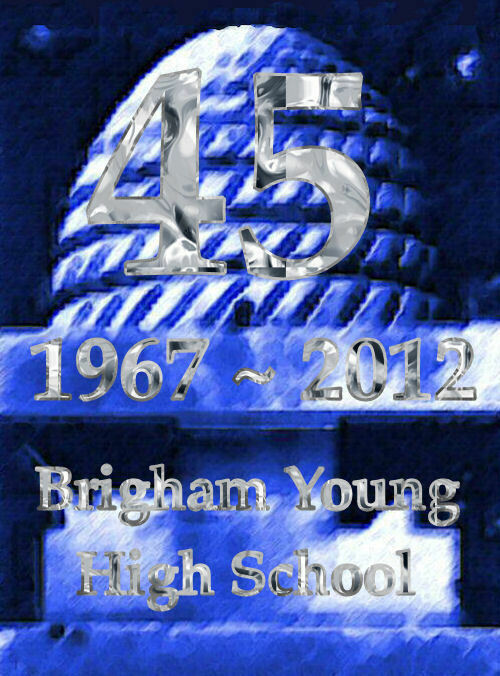 The B Y High Class of 1967 45th Anniversary Year Reunion was held Friday evening, July 6th at 5 p.m. at Dan Shaw's home in Elk Ridge, Utah. The cost was $10 per person which covered meat, bun, condiments, paperware, etc. Attendees brought pot luck dishes in the form of salads (green salad, macaroni salad, potato salad) & casseroles, anything that went with barbecue. They started with a meet-and-greet at 5 p.m. and then started barbecueing around 6 p.m. Everyone spent the evening with Old Old friends! A horseback ride took place the following morning for those interested. Joel Murphy organized the ride. Contact: De Ann at myagentdee@msn.com with questions. Thank you for all of your thoughts and prayers. I am home from the rehab center and doing much better. 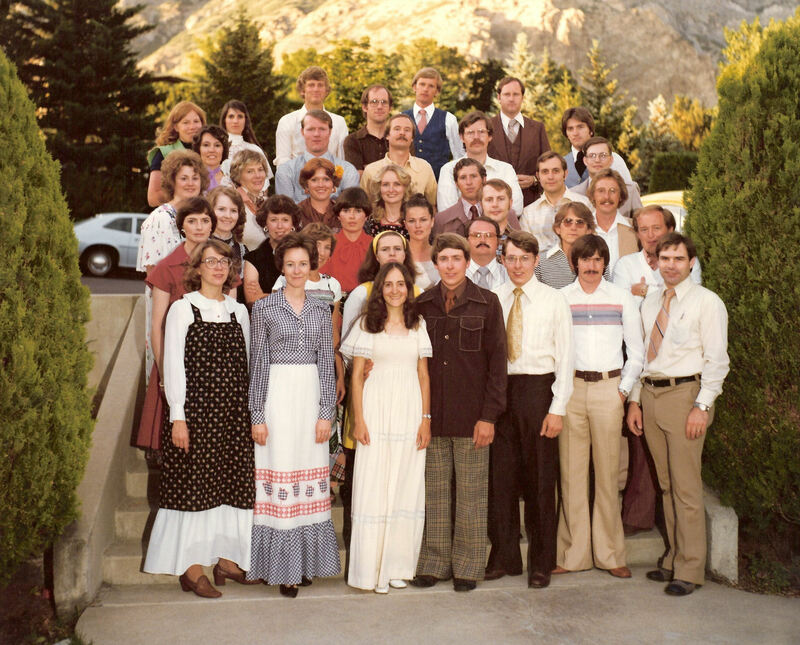 The 2007 photo is of the BYH Class of 1967 Reunion at their 45th Year Reunion in Provo. Back Row: 1. Joe Gee, 2. John Cunningham, 3. Jim Holtkamp, 4. Al Thomson, 5. Dan Clark, 6. Marilynn Monson, 7. Laurel Robison, 8. Royden Britsch, 9. Joe Andrus. 3rd Row: 16. Brent Ashworth, 17. Sid Sandburg, 18. Dan Shaw, 19. Val McOmber, 20. Russ Maxfield, 21. Mike Young, 22. Boyd McAffee, 23. Susan Payne. 2nd Row: 24. Scott Berryessa, 25. Joel Murphy, 26. Clark Crookson, 27. Dave Rich, 28. Tafta Johnson, 29. Ruby Kimball, 30. Kris Geertson, 31. Loren Duke, 32. Vicki Bohn. 38. Sue Thompson, 39. Kaye Jacobson, 40. Teresa Rawlings, and 41. Jeri Lea Elliott. Thanks to Susan Payne Rogers for the photo, and to Linda Rasmussen Smith for the identifications. 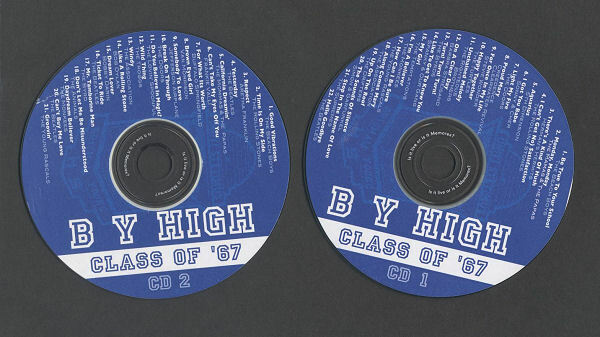 The BYH Class of 1967 is having lunch at the Brick Oven (Heaps) in Provo on Friday, August 17th at 12:30 p.m. We need some idea of who will be there as a room has been reserved for 25 to 35 people. Please contact a member of the reunion committee (see list at bottom of this page).. The Reunion Committee has added a casual get-to-gether on Friday evening of August 17 at 524 W. Vintage Drive, Provo, home of Susan Payne Rogers. We are asking everyone to bring their yearbooks, photos etc. to share. We have made a special memento to give to those who attend. We have had some fun as a committee reading what others wrote in our yearbooks. Some hope to rewrite any they are too embarrassed about having penned in ink. This party begin at 7:30 p.m. and end by 10 or so, because we will be up and in Payson to ride horses by 9 a.m. on Saturday. 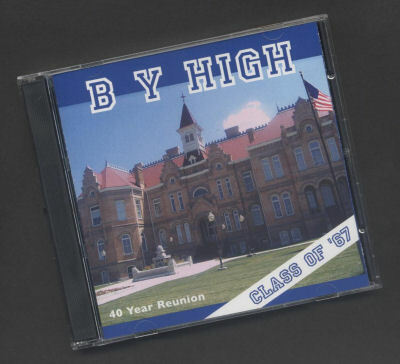 The Brigham Young High School 40th Year Reunion for the Class of 1967, including honorary members, has now been scheduled for Saturday evening, August 18, 2007, in the Riverside Country Club in Provo, Utah. The dinner is set for 6 p.m. This is the Saturday before BYU Education Week. An adult horse-riding activity will take place earlier on the day of Saturday, August 18 (see below). 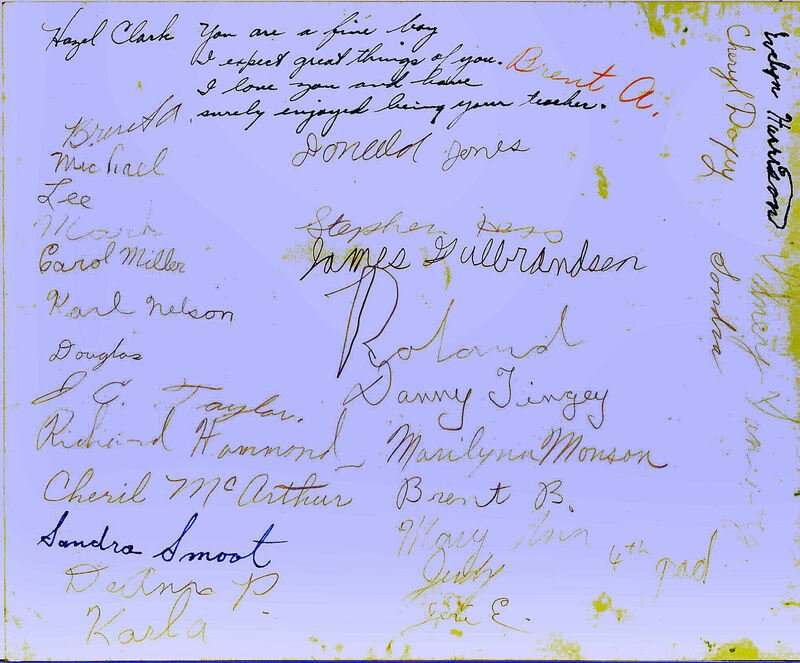 A group photograph of classmates will be taken at the reunion, and displayed on this page following the reunion. Dan would love to help supply some horses, and James Pinegar (Kris' hubby) and I will supply the rest of the remuda. We will pre-ride a couple of small loop trails near Dan's home in Payson canyon and give everyone that expresses interest an opportunity to ride. Children? Let's stay with classmates and spouses only. We can do this in two different groups if we get a large response - one hour or so for each trip, one starting at 10 am and another at noon. Dan Shaw will provide a continental breakfast before we ride at 9 and 10:30 on the 18th at his ranch – this in lieu of the Subway sandwich lunch that we had previously planned at the end. This will provide more time to stop by Brent Ashworth’s new store in Provo before the Academy Tour, or directly after at 3:30 - 4 pm. All class members and spouses are invited to Dan’s ranch, even if they are NOT horseback riding, to eat breakfast, visit and take photos. All of these horses are just barely broke and have been used as "Bucking Stock" in major rodeos throughout the West so everyone is guaranteed a ride they will never remember - if they recover, that is! NO, No, no -- just kidding - these are super gentle, "anyone can ride" type of horses that we have used with other less experienced riders over the years. 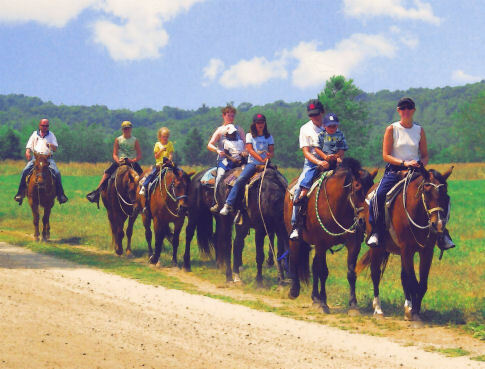 We invite class members and their spouses to come ride, see some great scenery and enjoy each others' company along the trail. Long pants, sunscreen and/or hats are recommended and bottled water or canteens can be put in the saddlebags, cameras are encouraged for Kodak moments and group photo ops. Some class members such as De Ann Terry, Joe Gee and Steve Peterson have horses or mules and may want to bring their own animals which would be even better - encourage any others that have to do likewise. We should be done (if we do two sessions) no later than 2 pm that afternoon. We have arranged for a special tour of the restored Academy building (our "old digs") with Douglas Smoot, and we will do that together immediately after horseback riding, at 3 p.m.
Let me know whether you can attend or not -- my phone number and email address are listed below for those who have questions about the horseback ride - hope to see y'all on the Trail! as it winds up to large indoor arena with green roof -- park it! Come early to visit and enjoy a continental breakfast! Put cowboy hat on head, spurs on boots, sunscreen on face and water bottle in saddle bag! And get ready to YeeeeeeHaaaaaaaaaaaahhhh! (which means "mosey down the trail" pardner). Get lost? No problem, Cowboy Joel Murphy will have his trusty cell phone in holster, call: 801-404-1199. 2nd group at 10:30 am. RSVP your preference to Joel so we can divide into equal groups. We hope to "beat the heat" by starting early and returning by noon. A continental breakfast will be served before each ride. Begins Saturday at 2 p.m. Arrangements have now been made for a guided tour of the restored BY Academy Building with Brigham Young Academy Foundation preservation leader, Doug Smoot, beginning at 2 pm that afternoon immediately following the ride. Provo City Library director, Gene Nelson, has reserved the Young Special Events Room (201) on the main floor across from the Art Gallery, to begin our tour. Doug led the effort and committee that took several years to raise funds for the restoration -- he will provide unique "behind the scenes" perspectives of the many challenges that were overcome to preserve this historic structure for future generations. Do not miss this only opportunity to learn where your former classrooms, locker rooms, study carols, etc. are now in this finished edifice. 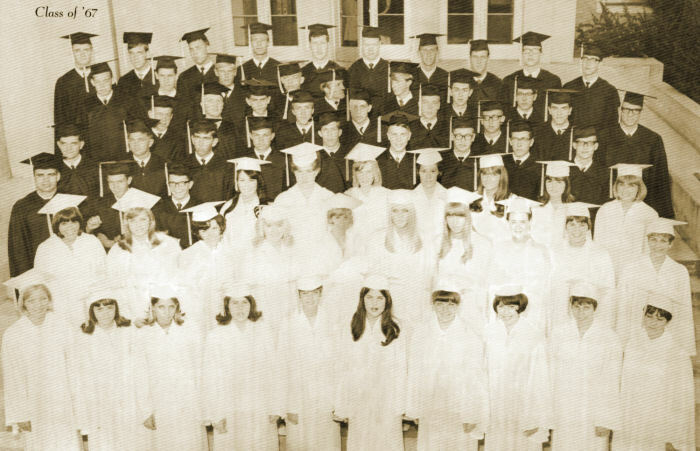 The building tour will conclude between 3 or 3:30 pm to allow members of the Class of 1967 to visit B. Ashworth's and to shower and attend the 40th Year Reunion dinner at the Riverside Country Club by 6 pm. We invite all BY High alumni to join us for this special tour, especially the classes of '66 and '68, who graduated before and after our class of 1967! Hope to see you in the Main Hall, Room 201, at 2 pm sharp on the 18th! Come & Go, 3 to 5 p.m. The Committee has also added a visit to see Brent Ashworth’s collection of artifacts and documents on Center Street in Provo, at any time between 3 and 5 p.m. after our tour of the BY Academy Building Saturday afternoon. The Class of 1967 40th Year Reunion dinner will be held on Saturday, August 18, 2007 at the Riverside Country Club. The event will begin at 6 p.m. A group photo will be taken at 6:30 sharp. Cost for the dinner is $35 per person. An additional $10 is requested from each person to cover the overall expenses of the reunion. Left to right, Back row: Mark Ericksen, De Ann Peterson*, Jimmy Jefferies, Richard Hammond, Danny Tingey, Karla Knudsen*, Karen Cloward, Larry Booth, Cheril McArthur, Byron Davis, and Sondra Young*. 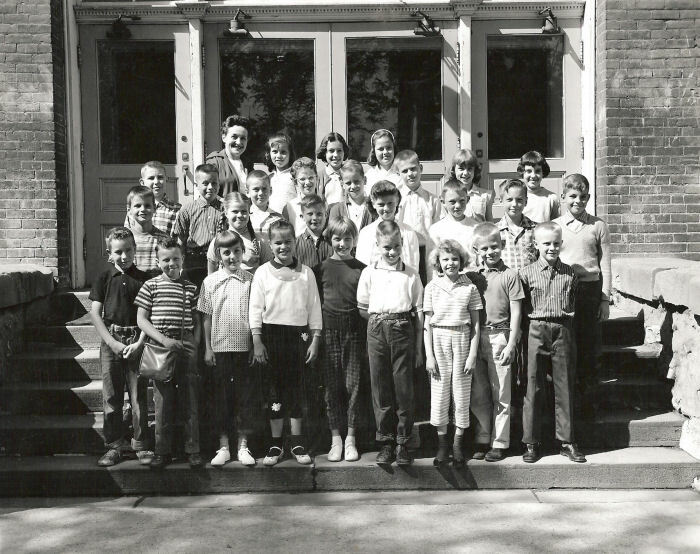 Middle Row: Donald Jones, Karl Nelson, Maury Williams, Mary Ann Bunker*, Carol Miller, Sandy Smoot, Roland Monson, Mike Young*, Jeri Lea Elliott*, Judy Watts, and Cheryl Doxey. Front Row: Steve Lewis, Lee Kirkman, J. C. Taylor, Alan Rockwood, Art Morin, Brent Ashworth*, Doug Wakefield, and James Gulbrandsen. Absent that day: Stephen Hess. 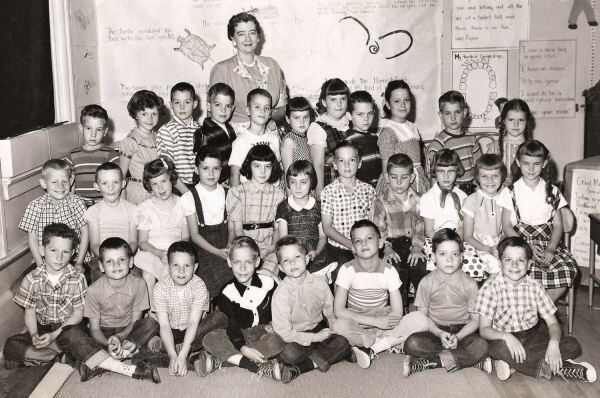 Teacher: June Carlisle, 2nd Grade, 1956~1957. Thanks to De Ann Peterson Terry, Dan Tingey, and Judy Watts Cannon for this photo and the identifications. 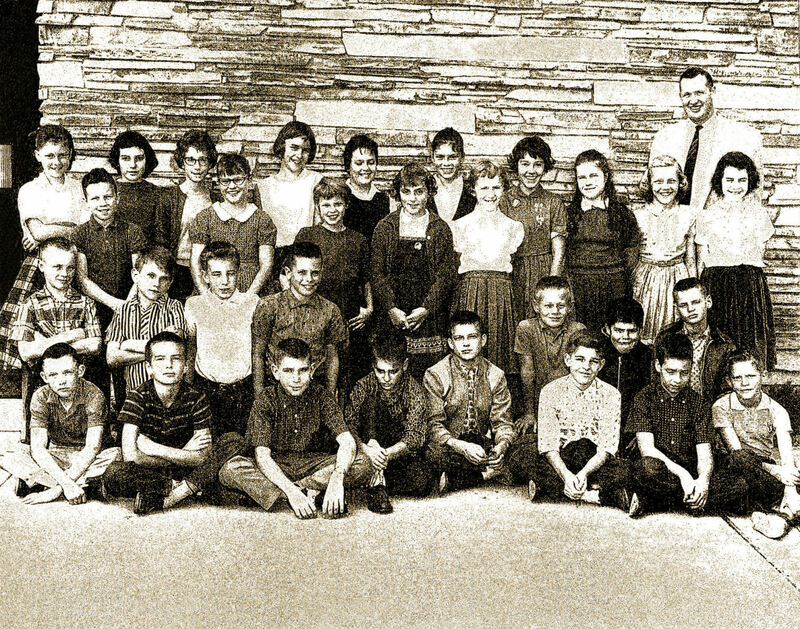 Others in the BYH Class of 1967 who later attended BY Elementary School include: Scott Berryessa, Evelyn Harrison, Marilyn Monson, and Sid Sandberg. Rear: 1. Teacher, Mrs. Elva Miller. Second Row: 2. Sondra Young, 3. Karla Knudsen, 4. De Ann Peterson, 5. Mary Ann Bunker, 6. Judy Watts, 7. Cheryl Doxey, 8. Mari Williams, 9. Marilynn Monson, 10. Jeri Lee Elliott, 11. Cheril McArthur, 12. Sandra Smoot, 13. J. C. Taylor, and 14. 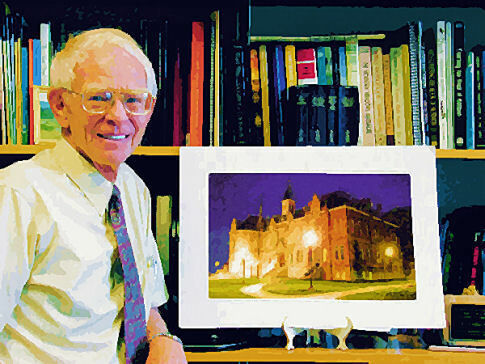 James Gulbrandsen. First Row: 15. Mark Ericksen, 16. Karl Nelson, 17. Roland Monson, 18. Jimmy Jeffreys, 19. Brent Barton, 20. Don Jones, 21. Danny Tingey, 22. Brent Ashworth, 23. Richard Hammond, and 24. Doug Wakefield. Thanks to Brent Ashworth for this photo, and to Brent and De Ann Peterson Terry for identifications. Left to right, Back row: 25. Teacher, Hazel Clark, 26. Mary Ann Bunker*, 27. Marilynn Monson*, and 28. Cheril McArthur. 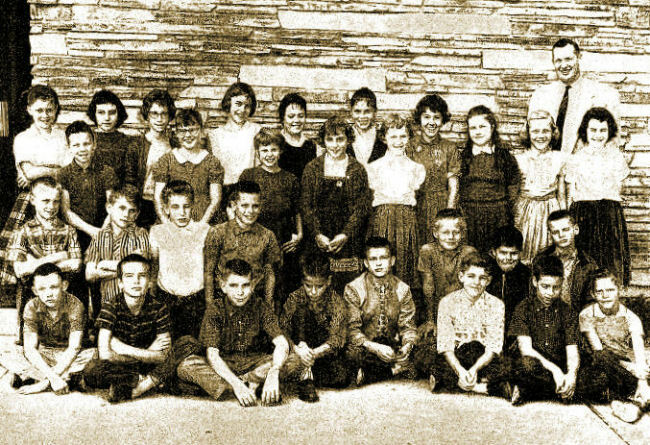 Back Middle Row: 17. Mike Young*, 18. James Gulbrandsen, 19. Stephen Hess, 20. Jeri Lea Elliott*, 21. Danny Tingey, 22. Brent Ashworth*, 23. Cheryl Doxey, and 24. Carol Miller. Front Middle Row: 10. Lee Kirkman, 11. Sondra Young*, 12. Brent Barton, 13. De Ann Peterson*, 14. Karl Nelson, 15. 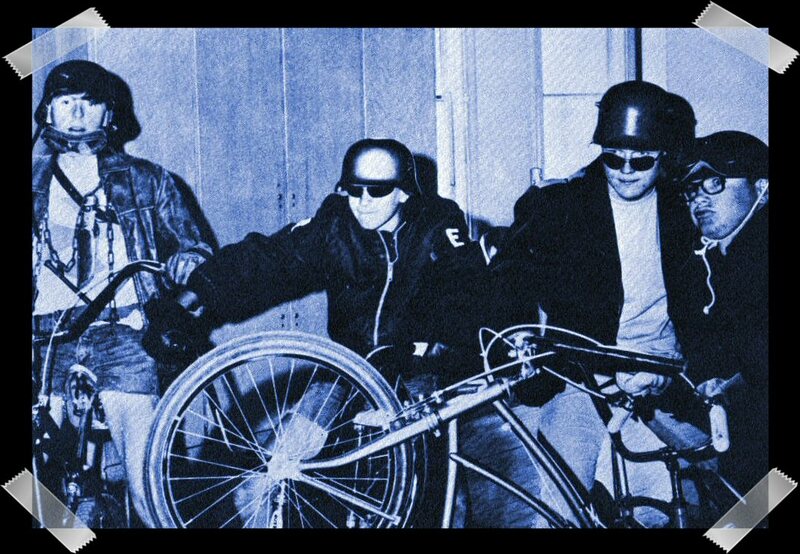 Roland Monson, and 16. Richard Hammond. Front Row: 1. Mark Erickson, 2. J. C. Taylor, 3. Sandy Smoot, 4. Karla Knudsen*, 5. Judy Watts, 6. Doug Wakefield, 7. Evelyn Harrison*, 8. Donald Brent Jones, and 9. Sid Sandberg*. Thanks to Brent Ashworth for this photo, and to De Ann Peterson Terry for the identifications. Click here for autographs of all 28! 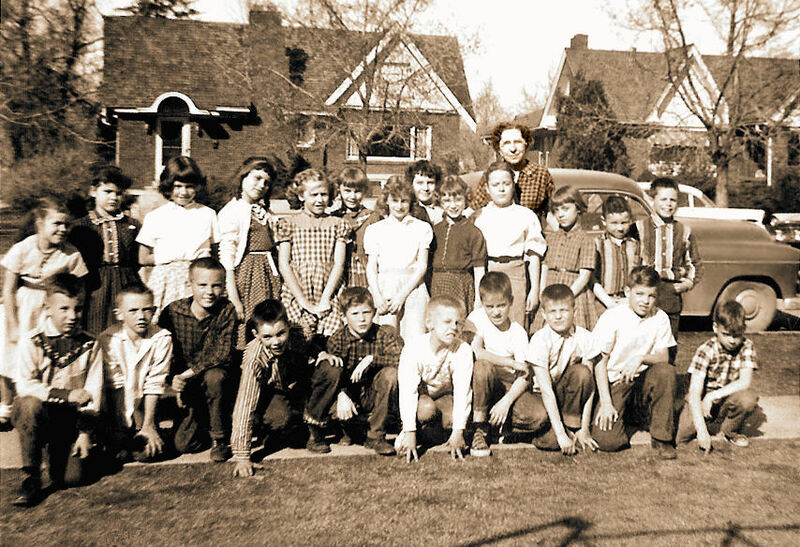 In the back, 6th Grade teacher, Gus Clark. Front Row, left to right: Karl Nelson, Roland Monson, Mike Young, Danny Tingey, Brent Ashworth, Richard Hammond, Doug Wakefield, and Brent Barton. 2nd Row: Sid Sandberg, Scott Berryessa, Mark Erickson, James Gulbrandsen, Don Jones, Doug Smith, and Lee Kirkman. 3rd Row: J.C. Taylor, Karla Knudsen, Evelyn Harrison, Sandy Smoot, and Julie Fuhriman. Back Row: De Ann Peterson, Carol Miller, Jeri Lea Elliott, Cheryl Doxey, Cheril McArthur, Mary Ann Bunker, Marily Monson, Sondra Young, Judy Watts, and Carolyn Hodson. Thanks to Brent Ashworth and De Ann Peterson Terry for this photo, and to De Ann for the identifications. First Row: 1. Kathy Hawkins, 2. Jena Vee Smith, 3. Kristen Geertson, 4. Sondra Young, 5. Evelyn Harrison, 6. Karla Knudson, 7. Shelley Melville, 8. Sandra Compton, 9. Vicki Bohn, and 10. Gayle Rogerson. Second Row: 11. Mary Ann Bunker, 12. Theresa Rawlings, 13. Linda Rasmussen, 14. Ruby Kimball, 15. Sue Thompson, 16. Terree Lockhart, 17. Jolayne Dancey, 18. Tafta Johnson, 19. Kay Jacobson, and 20. Jeri Lea Elliott. Third Row: 21. Dave Rich, 22. Lynn Black, 23. Boyd McAffee, 24. Dorcus Fowers, 25. Laurel Robinson, 26. Lis Christensen, 27. Marilynn Monson, 28. De Ann Peterson, 29. Kerry Lynn Cameron, and 30. Susan N. Payne. Fourth Row: 31. Greg Duerden, 32. Norm Boshard, 33. Mike Young, 34. Dal Olson, 35. Russ Maxfield, 36. Tom Chandler, 37. Mark Harston, 38. Clark Crookston, and 39. Brent Ashworth. Fifth Row: 40. Dan Shaw, 41. Sid Sandburg, 42. Scott Berryessa, 43. Stan Bergeson, 44. Brant Harmon, 45. Conrad Teichert, 46. Joe Andrus, 47. Lynn Sampson, and 48. Royden Britsch. Sixth Row: 49. Robert Grow, 50. Ron Smith, 51. Joe Gee, 52. Loren Duke, 53. Steve Bergeson, 54. Joel Murphy, 55. Glenn Monson, and 56. Byron Crookston. Seventh Row: 57. Jess Ellis, 58. John Cunningham, 59. Gayle Bluth, 60. Al Thomson, 61. Jim Holtkamp, 62. Dan Clark, 63. Steve Peterson, 64. Richard Erickson, 65. Val McOmber, and 66. Curtis Johnson. Pictured separately above: 67. Lowell Bennion, and 68. Kris Johnson. Thanks to Linda Rasmussen Smith and Susan Payne Rogers for the identifications. 1. Laurel Robinson Howard, 2. Marilynn Monson Ricks, 3. Sue Thompson Heaton, 4. Ruby Kimball Zabriskie, 5. Kerry Lynn Cameron Herrin, 6. Kay Jacobson Hill, 7. Vicki Bohn, 8. Lis Christensen, 9. Sandy Compton Glade, 10. Tafta Johnson, 11. Steve Peterson, 12. Dan Clark, 13. DeAnn Peterson Terry, 14. Mary Ann Bunker Jackson, 15. Kris Geertson Pinegar, 16. John Cunningham, 17. Al Thomson, 18. 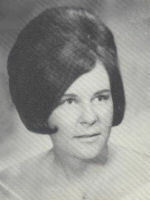 Susan Payne Rogers, 19. Karla Knudsen Womble, 20. Sondra Young Jones, 21. JenaVee Smith Crookston, 22. Joe Gee, 23. Jim Holtkamp, 24. Russ Maxfield, 25. Tom Chandler, 26. Boyd McAffee, 27. Byron Crookston, 28. Richard Erickson, 29. Brant Harmon, 30. Scott Berryessa, 31. Clark Crookston, 32. Lynn Sampson, 33. Brent Ashworth, 34. Joel Murphy, 35. Lynn Black, 36. Dan Shaw, and 37. Dave Rich. Thanks to Brent Ashworth for this photo, and to Linda Rasmussen Smith and DeAnn Peterson Terry for the identifications. 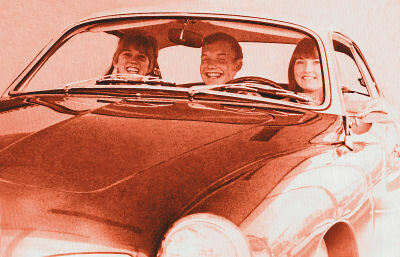 Kerry Lynn Cameron (right) drives Robert Grow and Julie Anderson (left) to Distraction in 1967. Awww, just a crumby commercial?!? 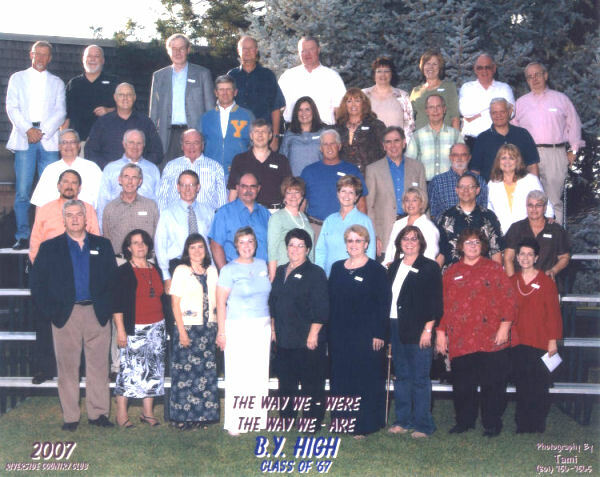 of the Class of 1967 Reunion in 2007. 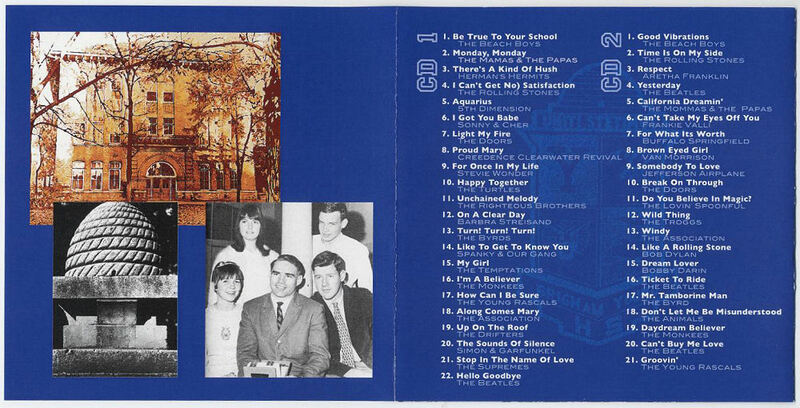 Visit Russ Maxfield's 5-Part 1967 Yearbook Video on YouTube.